To many Italian riders Milan-San Remo is like an annual world championship and it can make an Italian rider's season. In recent years a long, lean spell has been replaced by a flurry of Italian victors, with Gianni Bugno, Claudio Chiappucci, Maurizio Fondriest, Giorgio Furlan and Gabriele Colombo all claiming La Primavera. The unusual thing about Milan-San Remo is the fact that it is almost entirely predictable as to where the winning move will go. The final climb, the 4km long Poggio, has been the launch pad for countless victories in the race. The long distance the race covers, close on 300 kms, means that a rider with good form can make a decisive move on the final kilometre of the Poggio. 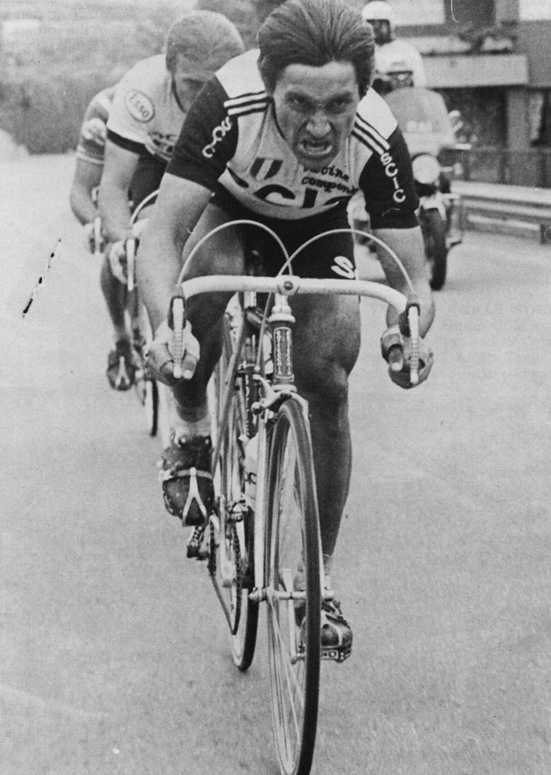 Fondriest and Furlan both won in this manner, as did Laurent Jalabert in 1995. The race itself features a long ride across the plains of Lombardy before ascending the steady Turchino pass before a twisty descent down to the outskirts of Genoa. 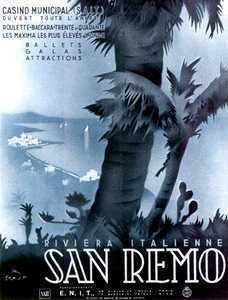 The race then follows the coast road to San Remo, with numerous diversions onto the small climbs that characterise this race. The climbs aren't severe enough to suit the true climbers so generally it is a good all-rounder, i.e. a true classics rider, who wins. 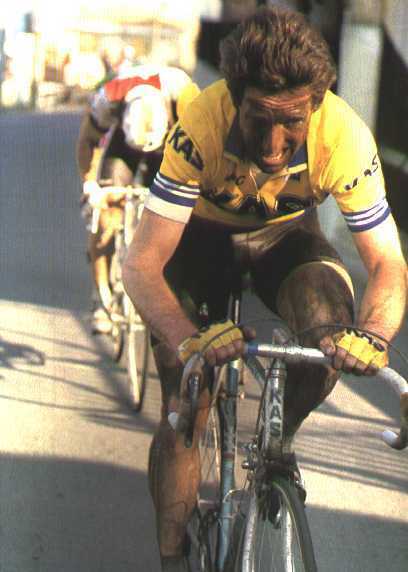 In 1977 a young Jan Raas escaped on Poggio to register a famous win"
This 25kb colour JPEG shows Sean Kelly en route to his first Milan - San Remo victory, in 1986.